I love pizza, but much prefer a thin base and crust rather than the doughy American versions. Having a bit more time on my hands, I rustled up some dough and made a pizza to go with a giant bowl of salad when my lovely friends Kristie and Annie popped round for dinner. Now, what I love about making your own pizza is you can chuck ANYTHING you like on there. I'm a huge fan of anchovies, but know a lot of people don't, so went with a BBQ Chicken style pizza, with lots of veggies on it. The great thing about making your own is that you get whatever shape you wish, I have a large rectangle baking tray so squidged the dough out to make that shape-ish. 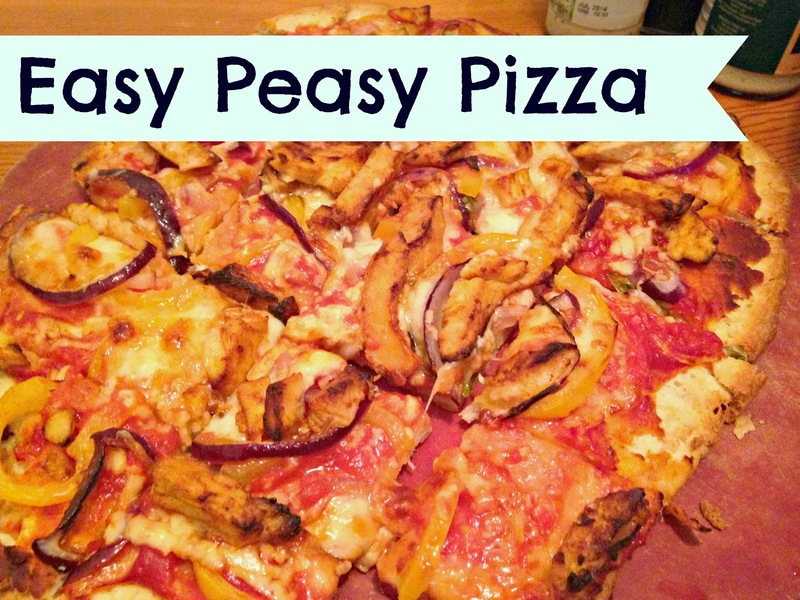 Making your Dough - easy peasy! Just mix 300g strong bread flour, and teaspoon of Instant Yeast with 200ml warm water (and a little Olive Oil) and mix together until you have a soft dough. I find it easier to leave in the bowl, add some flour and knead. Leave in a bowl covered with a tea towel, for about ten minutes then give it a little knead again. Topping Time - Some passata, basil and garlic, add some seasoning and you are done. Then you can get busy with the toppings. Use whatever you have lurking in your fridge. Great opportunity to clear out those half used jars of sauces, odd veggies and cheese bits.